Photo: Obi Anyadike/IRIN. Displaced women in Maiduguri. At least one million people have been forced from their homes as a result of the Boko Haram insurgency. MAIDUGURI, 10 February 2015 (IRIN) - Around one million Nigerians have been forced to flee their homes as a result of the Boko Haram insurgency in the northeast, according to the National Emergency Management Agency (NEMA). But the real figure is likely to be far higher, as NEMA officials cannot access the most insecure parts of the region. Extrapolating from NEMA’s count, the Presidential Initiative for the Northeast – a relief and recovery scheme – estimated last year that 1.5 million people had been displaced. More than 90 percent of those forced from their homes are staying with relatives and friends rather than the official camps run by NEMA. Many have pushed further south, some as far as the Middle Belt states in Nigeria’s central region. But for most people escaping the violence in Borno State, Maiduguri is the first real refuge. The sprawling city was once a gateway for trade with Cameroon, Chad and Niger – countries that have now joined a regional task force that has launched a major operation to defeat Boko Haram. Maiduguri has come under attack twice this year. The latest report from the UN Office for the Coordination of Humanitarian Affairs says the recent surge in fighting has prompted another wave of displaced people. Some 36,000, are now heading towards Maiduguri, and Mubi and Gombi in Adamawa State. IRIN spoke to a number of those who have been forced to flee. These are their stories. Boko Haram attacked Kondega, 34 km from Maiduguri on 11 February 2014. They used an armoured vehicle and RPGs (Rocket Propelled Grenades) to overcome the garrison, which Mohamed said had fought bravely. The six-hour battle ended at 10 pm. Mohamed and his seven-strong household escaped through the bush and walked to Maiduguri – the city where he was born. Ali, 60, had the narrowest of escapes when Boko Haram attacked Maiduguri through her Molai suburb on 1 February this year. Caught in the crossfire, a bullet grazed the length of her scalp. This is the second time she has been displaced. The first was last year when she was living in Yajiwa, 40 km north of Maiduguri. Boko Haram arrived in the rainy season (August-September) and stayed in their village. They took what they wanted – from livestock to food. “Yes I was scared. If you don’t do what they tell you, it’s trouble,” she said. A Nigerian air force jet bombed the village, destroying her house, but missed the place where Boko Haram were staying. 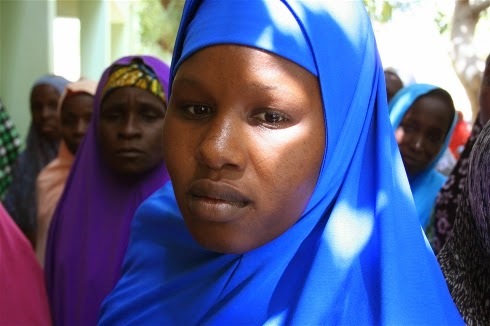 Ali fled with her disabled husband and four children to Molai, 10 km south of Maiduguri. But when Molai also came under attack, Ali moved in with her sister in the city. Her husband now lives with his relatives in a separate district. Ali sells groundnuts and her children and grandchildren beg on the streets to supplement her income. Last month, Bulama, 30, witnessed a group of people suddenly arrive in Damasak without warning. Their faces were covered and they wore an assortment of Nigerian military uniforms. They were Boko Haram. “If they saw you, they fired,” she said. The government soldiers in the area fled at sound of the first shots. Boko Haram searched the houses and executed any men they found. They gathered all the women together in the village head’s house and kept them there for two days, without any explanation. They were fed food looted from the market. On the second day, the insurgents left for another raid, leaving one man behind to guard the women. He told them now was their chance to escape, and led them to a path that took them away from the village. Bulama’s husband managed to hide in the bush when Boko Haram attacked. The couple now lives with his family in Maiduguri, in a household of 20 people that includes their six children. She lived a far better life in Damasak, but has heard Boko Haram are still in nearby villages. “By God, I’ll not go back yet,” she said. Boko Haram arrived at 3pm in Gwoza, 135 km southeast of Maiduguri, “and just started firing". It was during the rainy season last year. They were wearing Nigerian military uniforms. When people heard the gunshots they ran to the Emir’s [traditional leader] palace. The insurgents stopped people on the way and killed them. Government soldiers tried to fight back but ran out of ammunition. Her brother-in-law rented a place for her and the children in Maiduguri. She embroiders “damanga” caps to earn money, and when she runs short her brother-in-law helps her out. “I hope that after the election [now postponed to 28 March] things will improve,” she said - a reference to a suspicion here that the insurgency is at least partially politically motivated to destabilize the opposition’s northern stronghold. Ali lived close to the military barracks at Damboa, 90 km northeast of Maiduguri. She was used to the sound of the army testing their weapons. So when Boko Haram attacked in October last year, she initially thought nothing of it. The insurgents were wearing Nigerian military uniforms and had their faces covered. They searched the houses looking for the men. Her husband, a government official, hid in the roof and managed to get away. Boko Haram set fire to the house. They gathered the women together. But an argument ensued. Some of the insurgents said they had enough women and didn’t need to take any more. In the confusion Ali managed to escape and fled to a nearby village. The next day Boko Haram marched in and Ali slipped away again, back to Damboa. She said the military had tried to defend Damboa, but an air force jet mistakenly hit their positions, after which resistance crumbled. Ali insists she heard the insurgents proclaim that President Goodluck Jonathan “must win this election”. Damboa was attacked the day after it had celebrated a rumour that Jonathan had died in a plane crash.